As part of the allotment regeneration project, compost was delivered to the site to improve the condition of the soil. Tree surgeons were engaged to remove any dangerous trees. Members transported the compost to their individual plots. Manure was delivered to each plot as part of the soil conditioning programme. 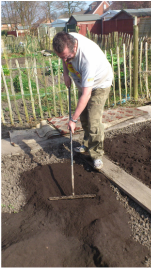 The compost was incorporated into the bed systems to raise the fertility of the soil. All branches removed were recycled to provide a 'mulch' for raised beds.